Smoking tofu transforms this nutritious but famously bland soy product into a startlingly tasty grilled entree. 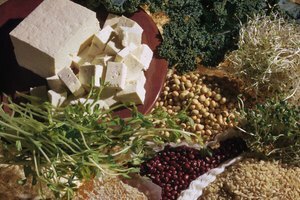 Tofu has long been the go-to, high-protein meat replacement for vegetarians, and its ability to absorb flavors from its surroundings is given a fine workout by the smoking process. To make your own you'll need a firm or extra-firm tofu, and either a smoker or gas grill to generate the flavorful clouds of smoke. Drain the tofu from its water packaging, rinse with fresh water and blot it dry with paper towels. Measure and combine a combination of dry spices or a liquid marinade, if you wish. Cut the block of tofu into slabs, strips or cubes, as desired. Rub the surfaces with your dry seasoning mixture, or toss it thoroughly in its marinade. Refrigerate for at least 30 minutes or as long as overnight, so the flavors can permeate the tofu. Prepare your smoker by loading it with charcoal and hardwood chunks, or in the case of an electric smoker by filling the smoke chamber with hardwood. 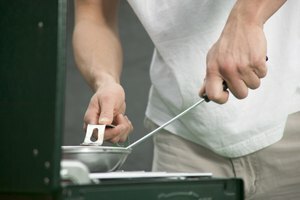 On a gas grill, fill the smoker box with hardwood if you have one. If you don't, improvise a smoker box by filling a foil baking pan with hardwood and covering it with heavy foil. Poke a few holes in the lid so smoke can escape. Heat the barbecue to approximately 300 degrees. When the hickory chips begin to smoke, the grill is ready. Brush olive oil onto the grill slats to avoid sticking and place the seasoned tofu as far away from the flames as possible. Slabs or strips of tofu can go on the grate as is, but cubes should be skewered for ease of handling. Close the barbecue's lid, and allow thick slabs of tofu to smoke for up to 1 1/2 hours. Smaller strips or cubes require only 30 to 45 minutes. Check the tofu near the end of your expected cooking time. 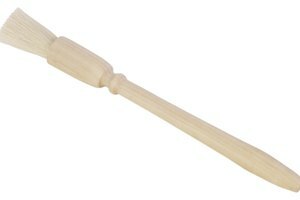 When its done it should be deeply browned at the surface, with a slightly tacky texture. Freezing tofu may keep it fresh for approximately three months but will also change its texture. That extra chewiness is usually considered a flaw, but it lends smoked tofu a more meat-like texture. Pressing the tofu under a plate weighted with a can of soup forces additional moisture from the soy curd, and gives it a denser, meatier texture that works well for smoking. Let it drain overnight on a cutting board that's angled into the sink, so the water can drain away neatly. Enthusiasts differ sharply on the question of whether the wood chips should be soaked before smoking. If you opt for dry chips, keep a squirt bottle nearby to mist them should they burst into flame instead of smoldering. Finishing the tofu at high temperature on your grill gives it a seared, flavorful surface and pleasant crust. Brush the tofu with a sauce or glaze, if you wish, for added flavor and a caramelized surface. 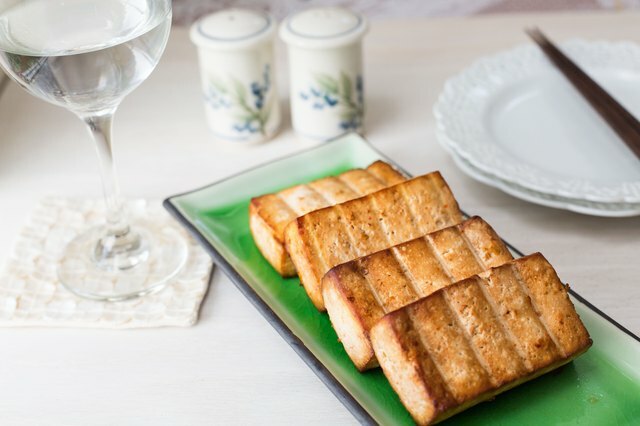 If using a tofu block that is not firm or extra-firm, or if the curing process was not long enough, the tofu may fall into pieces while smoking.